Earlier in March, rumors about a Samsung smartwatch boasting built-in cellular connectivity started to arise. 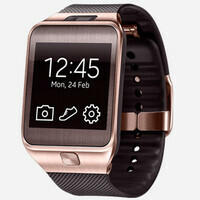 The upgraded Samsung Gear 2 variant will sport a SIM card slot, according to Korean media, and will be able to make phone calls on its own, unlike the Gear 2 model that's already on sale. At the time of the report's publishing, no solid evidence was presented to back up the claim, but now, it appears that the rumors may be onto something. A Samsung device with a model name SM-R710 has been found on Zauba – a web site that tracks parcels going in and out of India. Judging by its description, the gadget can be used as a mobile phone, and Samsung Gear 2 Solo could be its official name. Besides, the model name fits Samsung's scheme for naming wearables, as the Gear 2 and Gear 2 Neo are also known as the SM-R380 and SM-R381 respectively. Therefore, it seems safe to assume that this Samsung SM-R710 is a smartwatch as well. That's all we think we know about this mysterious Samsung Gear 2 Solo at this time. We'll pass along further leaks and rumors about it in case we come across any. I prefer this over the earlier gears. This i need not pair with my phone. Its a small phone i can bring anywhere since its just on my wrist. Hope its not pricey though. I'm more excited on how samsung will name their next galaxy gear after this one. lol. galaxy gear note maybe? Samsung Gear DUOS. Because someone obviously needs dual-sim on his wearable. ┐('～`；)┌ Why NOT. Will messaging me possible? Or whatsapp? Wish they'd spend more time and money perfecting low energy wifi instead of focusing on cellular which is very difficult to make low energy. A "solo" watch would be cool, but not if I have to charge it every 3-4 hours. Is SAR (Specific Absorption Rate) even more a concern here or with Smart watches in general?